Beaufort National Cemetery, located in Beaufort, South Carolina, is one of six national cemeteries established in 1863 for the reinterment of Union soldiers and sailors who died in the region. During the Civil War, Beaufort’s coastal position between Savannah and Charleston made it an early target for the Union. The cemetery’s plan is unique among other national cemeteries of the Civil War-era because of its landscape, which was laid out in the shape of a half wheel with roads forming spokes from the “hub” at the entrance. Today, more than 14,000 veterans lie at rest in the cemetery. During the early days of the Civil War, the Union adopted a strategy of controlling Southern seaports through occupation or blockade. Cutting off the Confederacy’s sea access limited supply lines and prevented trade with European countries. The Union selected Beaufort as a base for their blockade efforts. The city of Beaufort lies 10 miles inland along the Beaufort River. The river leads to the Port Royal Sound and empties into Atlantic Ocean midway between Charleston and Savannah, Georgia. Confederate commanders knew Beaufort was a likely target for the Union Navy and constructed fortifications at the river’s mouth in July 1861. The Confederacy built two forts, Fort Walker on Hilton Head Island and Fort Beauregard across the sound on Phillips Island. In November 1861, a Union fleet of 71 ships with 14,000 troops began an assault on the forts. The overwhelming naval bombardment drove the Confederate defenders to abandon the forts. By the end of the day, Union forces had secured both forts protecting the sound. A month after the Battle of Port Royal, Union forces occupied a deserted Beaufort. The Union moved quickly to establish a fleet headquarters in the Port Royal Sound repairing, reinforcing, and renaming the Confederate forts. Construction commenced on a foundry, supply depot, and naval repair facility to support the South Atlantic Blockading Squadron. With more than 100 warships, the squadron could attack Confederate seaports from South Carolina to the Florida Keys. 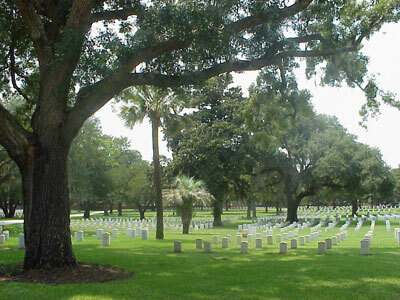 The Union established a national cemetery in 1863 for the remains recovered from graveyards on Hilton Head and other islands in the Port Royal Sound, Charleston, eastern Florida, and Savannah. Between 1863 and 1968, the military transferred 2,800 remains of Union prisoners of war from a Georgia cemetery. The national cemetery also contains the remains of more than 100 Confederate soldiers. 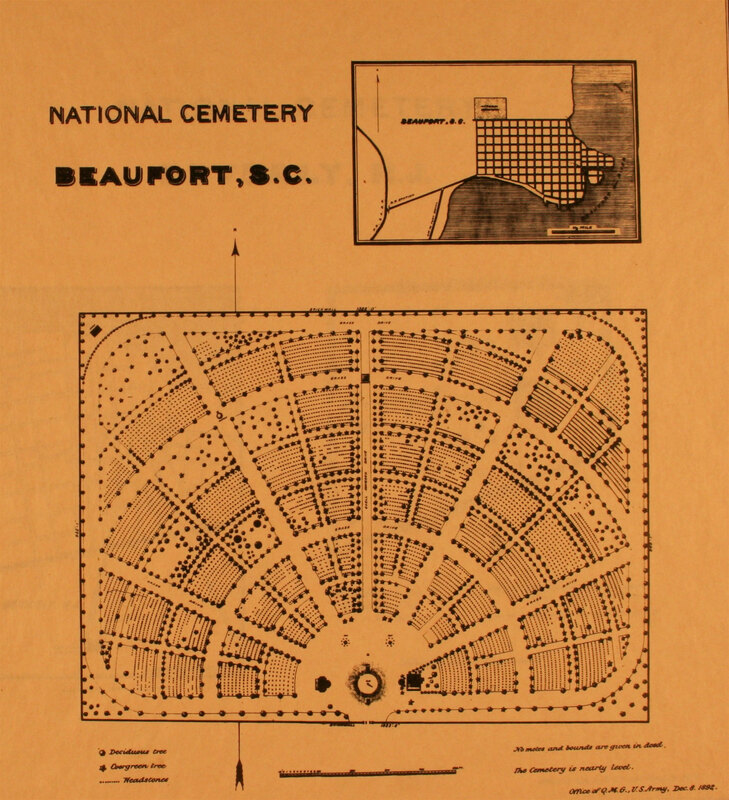 1893 Site Plan of Beaufort National Cemetery. The cemetery’s layout is that of a half circle contained within a rectangular boundary. A brick wall, constructed in 1876, defines the property. Five avenues, emanating from the cemetery’s gated entrance, form spokes intersecting with an arched avenue at the back of the cemetery. In 2004, the cemetery expanded by approximately 15 acres beyond the northern wall and has a different layout and circulation pattern. The entrance features double-iron gates supported by large limestone piers that were installed in 1940 at the center of the southern wall. A simpler iron gate at the end of the central avenue provides access to the new sections of the cemetery. The lodge and a utility/storage building flank the flagpole at the main entrance. Built in the 1930s, the two-story lodge features a gambrel roof with shed dormers, and is evocative of the Dutch Colonial style that was popular at the time. The brick utility building opposite the lodge dates from 1894. Additions to this building in 1949 created new space for storage and vehicles. Four commemorative monuments are located on the cemetery’s grounds. A granite obelisk standing 20 feet high honors those who died for the Union. Eliza McGuffin Potter, a woman who cared for soldiers in Beaufort’s military hospitals, erected the monument in 1870. Potter was also the force behind the construction of another of the cemetery’s monuments, an 1870 marble and brick box tomb inscribed with the names of 175 soldiers from 18 states. A memorial to Confederate soldiers placed in the Confederate section was dedicated in 1997. The north side of the cemetery contains the fourth monument, two granite blocks affixed with bronze plaques recognizing a number of African American Union soldiers reinterred at Beaufort National Cemetery in 1989. The soldiers were originally buried on Folly Island, South Carolina, the site of an 1863 Union winter camp. Their remains were discovered in 1987, and subsequent research identified them as soldiers of the 55th Massachusetts Regiment. The remains were subsequently transferred to the Beaufort National Cemetery. At cemetery's 1989 Memorial Day ceremony, which was attended by Massachusetts Governor Michael Dukakis and descendents of African-American Civil War veterans, the soldiers were reinterred with full military honors. Another significant burial in the cemetery is Master Sergeant Joseph Simmons of the 25th Infantry Buffalo Soldiers, one of four African American regiments created as a part of the U.S. Regular Army after the Civil War. Simmons fought on three French fronts in World Wars I and II. In 1999, the Republic of France awarded him the Legion of Honor Medal, the equivalent of the United States' Medal of Honor, for his service on French soil in World War I. Simmons died shortly after the medal ceremony, 21 days prior to his 100th birthday. 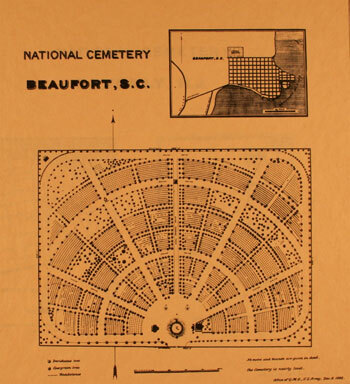 Beaufort National Cemetery is located at 1601 Boundary St. in Beaufort, SC. The cemetery is open for visitation daily from 8:00am to sunset; the administrative office is open Monday to Friday from 8:00am to 4:30pm, and closed on all Federal holidays except for Memorial Day and Veterans Day. For more information, please contact the cemetery office at 843-524-3925, or see the Department of Veterans Affairs website. While visiting, be mindful that our national cemeteries are hallowed ground. Be respectful to all of our nation’s fallen soldiers and their families. Additional cemetery policies may be posted on site. The Parris Island Museum, located on the Parris Island Marine Corps Recruit Depot, explores the history of the U.S. Marine Corps and the Port Royal Sound area. Exhibits interpret the Battle of Port Royal, the Civil War naval engagement that led to the Union control of the sound and nearby Beaufort. The museum also features exhibits on the Charlesfort-Santa Elena National Historic Landmark, the sites of 16th-century French and Spanish colonies on the island. The museum is located on an active military base, so visitor access may be dependent upon current security needs. The depot’s website provides additional information for visiting the museum. Beaufort National Cemetery was photographed to the standards established by the National Park Service’s Historic American Landscapes Survey.